Internet citizenship is being sold on eBay auction! Have you heard something about Internet Citizenship? It appears that you can buy it now on eBay auction. 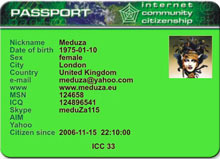 Two guys have made the site www.internetcitizenship.com and sell citizenships. As I have understood, they sell the first page of the site – the first hundred of citizenships - through the eBay. And the rest numbers it’s possible to buy right now on the site. On the site it is suggested to become an Internet citizen for 10 Euro and to get a unique number. For 15 Euro you can get a plastic passport of an Internet citizen (looks like real document, but with your virtual data and avatar instead of photo). Definitely, there is something interesting in it. It would be fanny to become a citizen #1 or #666 (for instance). Let’s see, what will come of it.